Hello and welcome to Kyiv Comic Con official page. Our web currently does not support full English version, but you can get some basic information on this page. When is Kyiv Comic Con? Next Kyiv Comic Con will take place on 1-2 of June 2019. You can see the working hours of the convention in the upper left corner of the main page. What is Kyiv Comic Con? 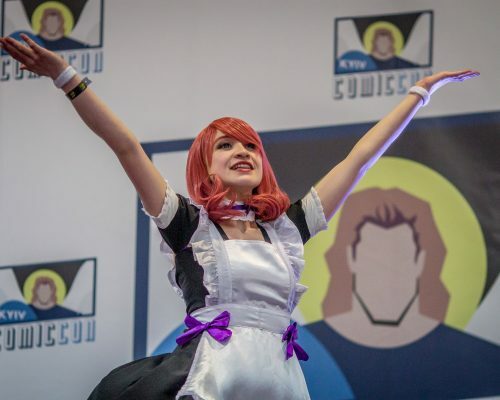 Kyiv Comic Con — Ukrainian biggest pop culture convention attended by more than 12 thousand people in 2018. It takes place annually since 2015, usually in the mid of May or early June. Event’s program is divided to 8 branches, covering most of the popular culture: Comic books, Video Games, Cinema, Cosplay & LARP, Board Games, Sci-Fi and Fantasy Literature, Anime & Manga and special program for children. Our venue has it’s own big cinema hall with 477 seats and modern high end audio and video equipment. This allows us to host premiere screenings of Hollywood blockbusters, Ukrainian films, and Japanese anime. We also organize presentations of upcoming movies and video games, panels with studios and creators. Comic Con is the main Ukrainian convention for comic book presentations. And we also host biggest cosplay show. What can I do as a non-native speaker? Kyiv Comic Con is attended by people from all over the globe and usually they find a lot to enjoy. There is a lot of content in English: games, comic books, movies. Even some events, lectures and presentations are carried out in English, yet most of them are in Ukrainian or Russian languages. There is also roughly 8 hours of cosplay show that, obviously, doesn’t require any language knowledge from spectators. All our social media channels provide full support in English and there you can ask any questions and get full list of inside events that are non-native speaker friendly. Our volunteers can provide you with basic guidance in English at the venue, as well. Where is Kyiv Comic Con? It takes place on Khreshatyk, 2, which is the central street of Kyiv. Any other events during the year? Please be sure to follow us on Facebook, Instagram, and VK for latest updates and support. Hope to see you next time!